Northern Virginia Cloud-Based Computing FAQ | ATI Solutions, Inc. What are the special IT considerations for banks? Customers using online banking have seen a technological boom from financial organizations, making it easier to do business with the click of a button. A bank’s online platform must be user-friendly and available to customers 24/7, but also has to have security measures that meet state and federal standards for data protection. Financial institutions face not only all of the online security risks of other businesses, but also the added hazard of being a prime target for cyberattacks. Cybercriminals are constantly looking to exploit weaknesses in security systems, making it vital for banks and other financial institutions to consistently improve and implement new defense measures. Theft of protected information. Banks have a duty to protect sensitive financial information, including customers' and employees’ personal identifiable information (PII). Data such as bank account numbers and balances, Social Security numbers, addresses, lending statements, and payment card numbers can all be sold on the black market and be used for identity theft. Penalties and fines. Each nation is responsible for controlling the security of financial information in its banks. Financial service providers operating in the U.S. are required to comply with numerous statutes and regulations pertaining to data collection and protection, as well as state or provincial regulations regarding the security of sensitive information. Failure to implement these controls can result in significant fines for bank owners and officers. Mistaken transmission of sensitive information. Financial institutions may have adequate security of their hardware, but use applications and third-party providers with undiscovered vulnerabilities. Email clients, file sharing services, and cloud storage systems can allow the transmission of protected data outside the bounds of a secure network (where opportunistic cybercriminals can easily access it). Loss of reputation. Even if a data loss event occurred because of an unknown glitch or an external entity, a financial institution will inevitably be associated with the event—especially if a strong data loss recovery system is not in place. The failure to implement data loss and recovery that meets industry standards ultimately results in a loss of reputation that can permanently halt operations. 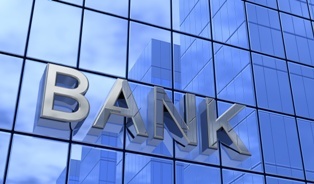 ATI Solutions has provided IT services to community banks for over 20 years, and can implement financial infrastructure that is compliant with regulations and scalable to you your bank’s growing needs. Contact us today to get more information about the storage and service options in our D.C. data centers, or set up an appointment to tour our Chantilly facility. 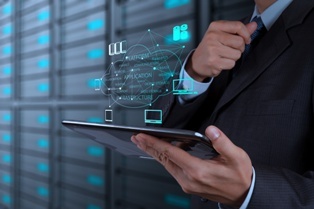 Is it Time to Transition Your Business to a Hosted Computing Platform? Cloud computing allows businesses to run many different online environments from the same physical hardware. One “host” machine can run millions of “guest” virtual machines (VMs), each one with the ability to run entire operating systems and perform all of the functions of a physical computer. A hypervisor is software, firmware, or hardware that controls the guest operating systems and manages the activities on all of the virtual machines. Hypervisors, also called virtual machine managers, separate a computer’s applications and operating system from its physical hardware. The hypervisor allows multiple virtual environments to exist on the same physical machine while remaining isolated from one another. With more virtual machines and fewer physical machines, having a large infrastructure becomes drastically more affordable. One of the most important benefits of hypervisors is that if one of the many VMs crashes or is corrupted, recovery is quick and easy since it only affects that one VM, leaving the rest of your virtual infrastructure unscathed. There are two types of hypervisors: type-1 or type-2. Type-1 hypervisors, known as “native” or “bare metal” hypervisors, run directly on the host's hardware to control the hardware and manage guest operating systems. Type-2, also called “hosted” hypervisors, run on a conventional operating system with the guest operating systems running as a process on the host. The hypervisor layer separates the guest operating systems from the host systems, while running all of the virtualization processes. The professionals at ATI can evaluate your needs and help you determine which storage and service options are right for you. Contact us today to get more information about how our data centers can serve your needs or set up an appointment to tour our Chantilly facility. Why should I choose ATI over Amazon Web Services (AWS)? Business owners often consider Amazon Web Services (AWS) when they begin transitioning their business to the cloud. As a large provider of web services, AWS can offer cloud computing at a relatively low cost. However, many independent providers offer the same products and services, with the added benefit of keeping your operations close to home. ATI Solutions offers the same flexibility and scalability of major cloud providers with the addition of having a full-service staff of technicians on-site and ready to help clients implement the platform and deployment options that work for them. Since we offer multiple levels of cloud deployment that allow you to maintain as much control of your online processes as you’re comfortable with, your customers enjoy a quality online experience, and you have the peace of mind that your business will remain up and running at optimal levels 24/7. What if my business needs change suddenly? – ATI’s hosting options are tailored to each individual client we serve, and we recognize that your cloud computing requirements must be flexible. You will not be limited to a set amount of bandwidth or storage, and can quickly access additional computing resources as you need them—and with our “pay as you grow” pricing, you will only be charged for the resources you use. Will I have to get all new software? – Our services support multiple operating systems and programming languages, allowing you to select the programs and development platforms that are most beneficial to your business. In addition to deciding which services you want to use, you can also select the manner in which they will be implemented. What if an adverse event occurs? – Our servers are configured to switch mission-critical operations to offsite secure alternative servers in the event of a power outage or other service interruption. We have multiple redundancies in place to ensure minimal end-user disruption. What if I need help? – Our technicians are available around the clock to provide intervention in the case of an emergency as well as help you discover better and more efficient ways to serve your customers. Infrastructure as a Service, or IaaS, is a way for businesses to have flexible cloud computing without the need for installing and managing their own virtual platforms. A third-party cloud provider hosts the infrastructure components—including servers, storage, and networking hardware—allowing the business to run its online processes and applications through the cloud. IaaS is a great option for businesses of all sizes who want to focus on their daily operations without devoting resources to IT management. The infrastructure is hosted on the business’ server and the client accesses operations remotely over a network. The system stays in a secure location, and the business runs all of its programs through a virtual environment using virtual machines (VMs). Cost benefits. IaaS is typically purchased on a usage-based, pay-as-you-grow system, and only charges clients for the number of machines and resources that are actually being used. Resilience. IaaS cloud providers have the ability to run large numbers of VMs for multiple clients, allowing businesses to run large workloads without worrying about service availability and performance. Scalability. Clients can scale their needs up or down without delays or service interruption, while not having to worry about purchasing additional licensing for the hypervisor or virtual platform licensing—which can become costly very quickly. Security. Not only do data centers offer physical security, but there are also additional options for virtual security. These include the most up-to-date patched systems, intrusion detecting software, virtual environment security that is segmented over a massive network of WAN connections, and virtual private networks (VPN) to protect data during transmission and storage. Backup and data recovery. IaaS can be utilized from any secure terminal, making it easy to institute a disaster recovery plan immediately using cloud-hosted backups. With IaaS, your back up and data recovery is available depending on your back up schedule and retention time periods. ATI Solutions is proud to offer a wide range of technical services for all business sizes and types of operations. Our highly flexible IaaS options can support large numbers of virtual machines with fully-redundant backups, allowing your IT processes to be as resilient and stress-free as possible. Our DC-area data centers offer all the power, connectivity, redundancy, and security you need in a location that is close to home. Contact us today to get more information about how our data centers can serve your needs or set up an appointment to tour our Chantilly facility.